Are you a super-turbo autumn fan? Your dream town is close at hand. JUST WHEN YOU THOUGHT... that apple-based cuisine and apple-flavored drinks and apple-cute desserts had reached the apex of apple-awesome ingenuity, along comes a new way to fry apples and slice apples and make apple smoothies, the kind that are chunky with almond butter and oatmeal and the thousand other foodstuffs and ingredients that go well with the shiny-of-skin tree fruit. In short, it is a delicious and healthy edible that is forever finding fresh invention, new fans, and its annual reintroduction as the crunchiest of seasonal treats when autumn rolls around. 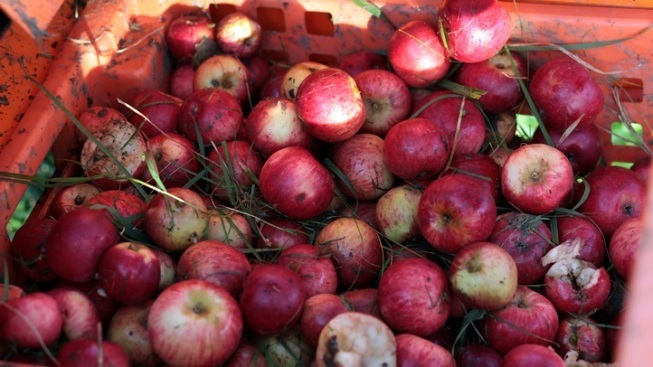 Apples and autumn are a twosome as old as apple trees and fall, and places like Oak Glen, near Yucaipa, find whimsical and tasty ways to honor that pairing each and every October and November. That's the heart of apple time at the mile-high spot, and not only are trees a-changin' in the area, but restaurants and stands and craft booths and orchards are doing their charmingest darndest to delight in all things pomme. WELCOME TO APPLE COUNTRY: That's one of the names for the Oak Glen region -- "Apple Country" -- and it fits, from the many ranches and farms (Riley's, Snow-Line, Los Rios) to the eateries serving up classic apple pies (Apple Annie's, Law's Coffee Shop) to the shops lined with candles and lotions and apple-bedecked greeting cards and apple-shaped sugar shakers and apple-shaped everything. It's pretty much Autumn Central, for the Southern California stretch, along with Julian near San Diego. Oh, for sure, other places know their apple-y stuff, but Oak Glen and Julian see a lot of fall fans come the close of the year, and with good reason: With all of our sunshine and ocean and palms, we still want a dose of pastry-topped apple filling and apple cider and apple donuts, along with all of the country crafts and hearty lunches and wineries and orchard visits a day in the hills promises. Want to plan your Saturday drive and all of the apple-esque edibles you'll consume, the better to fill up on all the autumnal goodness you can before winter arrives? Find your fruit-forward fun here, fall people.